Might the Brewers and Braves be close to settling on full-time closers? Scott White looks at the latest bullpen happenings. Now 2 1/2 weeks into the season, it's becoming ever so clear that closer committees are a reality in 2019. Our best hope in Fantasy is that some of those committees dwindle down to one. A couple bullpens may be on the verge of it, depending how the next couple weeks play out. The Brewers may have just cause to shift Josh Hader back to the multi-inning setup role where he thrived last year, and the Braves may soon discover they have only one reliable option at the back end of games. Meanwhile, several other closer situations have only grown murkier since the last check-in. Let's look at how things currently stand. Note: "Pecking order" refers to rosterability in Fantasy and not necessarily who's first in line for saves, though it's usually one and the same. Yes, Jeremy Jeffress is set to return from his bout with shoulder soreness Tuesday, and considering he finished only one save behind team leader Corey Knebel last year, handling the role mostly in August and September, it's reasonable to assume the Brewers would use him there again, putting Josh Hader back in the role where they'd prefer him. "We'll get Jeremy out here and get his feet wet, so to speak, before we put him in the spots we saw him in last year," manager Craig Counsell told MLB.com, keeping things as vague as you'd expect in the era of bullpen committees. Of course, Jeffress has to prove himself first after struggling on his rehab assignment, allowing at least one earned run in each of his four appearances, but the Brewers are convinced that the stuff responsible for his 1.29 ERA last year is there. His rise to the closer role would be to Hader owners' detriment, naturally, but nobody drafted the lefty expecting him to be first in line for saves. He's must-own regardless. Anyone who wondered why Arodys Vizcaino wasn't getting more love on Draft Day despite compiling a 2.79 ERA over the past four seasons knows the answer now: He can't stay on the field. Worse, it's a recurring issue with his throwing shoulder, which has the Braves looking deeper at solutions. We can't rule out a long-term absence. Even if it's a relatively short stay, A.J. Minter, who was already sharing the role with Vizcaino, has a chance to take the job and run with it. He was groomed to be a closer in the minors and has the requisite bat-missing ability, but he'll need to show he can throw strikes with consistency. If not, the Braves remain one of the teams most closely connected to free agent Craig Kimbrel. Just when you think you have Alex Cora figured out, the Red Sox manager throws you a curveball by saving his curveballer, Matt Barnes, for the ninth inning of a one-run game Sunday, using team saves leader Ryan Brasier in the eighth.The Red Sox extended the lead to four in the bottom half of the eighth, so Barnes didn't end up getting a save. Still, it suggests Cora may not have a favorite even though Brasier is responsible for each of the team's past three saves. He and Barnes are both easy enough to keep around in categories leagues, as well as they're pitching. Blake Parker was beginning to look like the clear front-runner in a particularly messy bullpen until putting three runners on in a two-run game against the Tigers on Sunday. Trevor Hildenberger bailed him out, striking out the only two batters he faced, and is off to a nice start, having struck out nine in 5 1/3 scoreless innings. The side-armer recorded seven saves for the Twins in 2017 and isn't totally out of the mix, but it'll probably take more than just one bad outing for Parker to fall out of favor with manager Rocco Baldelli. I still view Taylor Rogers as the most talented — and possible ratios help in 5x5 leagues — but as the left-hander of the bunch, he may be needed in a more versatile role. How big of the mess is this bullpen? Neither of the top two in my "pecking order" has a save yet. 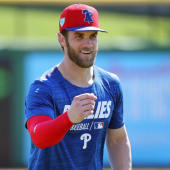 Hector Neris and Pat Neshek each has one, as does left-hander Jose Alvarez most recently, but it's completely up to the whims of manager Gabe Kapler, it seems. David Robertson is the one being paid like a closer and has closer experience. He also had four consecutive scoreless appearances after a rocky start to the year, most recently throwing two innings in Sunday's extra-inning affair (wherein Alvarez eventually recorded the save). But now Robertson has landed on the IL with a sore elbow, so the deck gets shuffled again. At least there's hope for finding saves in Philadelphia, a winning team with a number of serviceable arms. It may be too much to ask from the Royals bullpen. Ian Kennedy is the one who's pitching well and did record a save back in March. But he blew one in his next chance and hasn't gotten a chance since. Wily Peralta converted the team's most recent save chance Saturday but has more walks than strikeouts on the year and is a disaster waiting to happen. Richard Lovelady is the dark horse here, having delivered excellent ratios in the minors, but he's a left-hander, which makes for longer odds, and got knocked around in his third appearance Sunday.